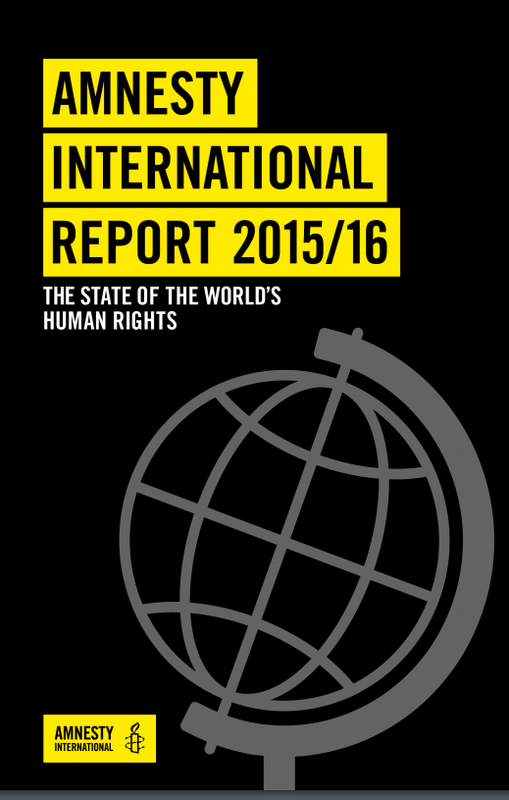 Amnesty International cemented its reputation for anti-Israel bias with its 2015/2016 annual report. 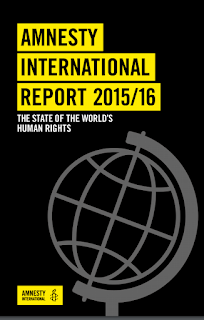 Based on the number of mentions of countries in the report, Israel appears to Amnesty to be the second worst violator of human rights, besides Syria. The fact is that the world trusts Amnesty to give an accurate portrayal of the relative severity of human rights abuses. 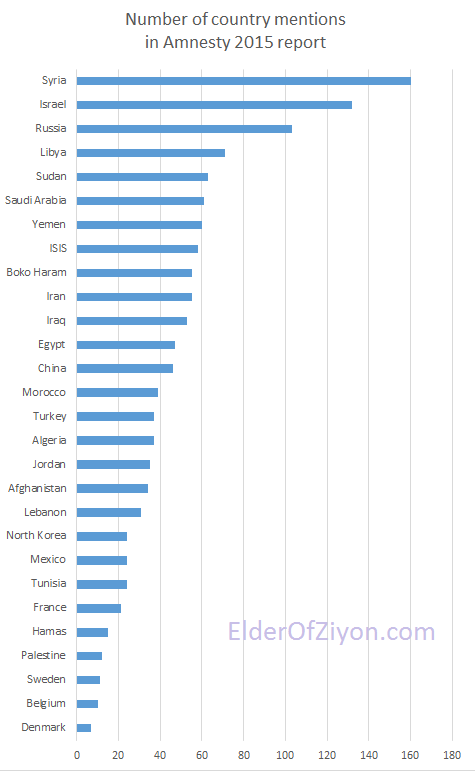 And because of years of this kind of obscene anti-Israel bias from Amnesty and others, many in the world really believe that Israel is nearly as bad as Syria, and worse than every other country, in the area of human rights. It is not even worth the time to disprove it. Those who actually believe that the Jewish state is this bad are either seriously lacking in basic fact checking abilities or they are de facto antisemitic. Even if you believe every one of Amnesty’s charges against Israel, to compare the scale of Israel’s alleged crimes against those of other countries – people killed by the authorities, amount of land taken, number of arrests, journalists detained, name your metric – Israel would not be close to the top for any of them. If you do a true comparison of how nations protecting their citizens under continuous attack protect human rights, Israel would be the best. But we cannot trust Amnesty to actually give us facts and figures. We cannot ever expect Amnesty to offer context. That is not their stock in trade. They prefer baseless accusations, exaggeration, belief in the most outrageous and allegations and no sense of context or proportionality when they write their anti-Israel screeds. Amnesty can do this because it is guilty of the crime it most often hurls at others – impunity. No one goes after them and when they are shown to be liars, they don’t even acknowledge their errors let alone correct them. Amnesty is not about human rights. It is about confirming the existing biases that its researchers have and then shoehorning the data to fit those biases. Their Middle East researchers made up their minds that Israel is evil long ago – now they spend all of their time pretending to prove it by fudging the facts. And all the proof you need is in the chart above. 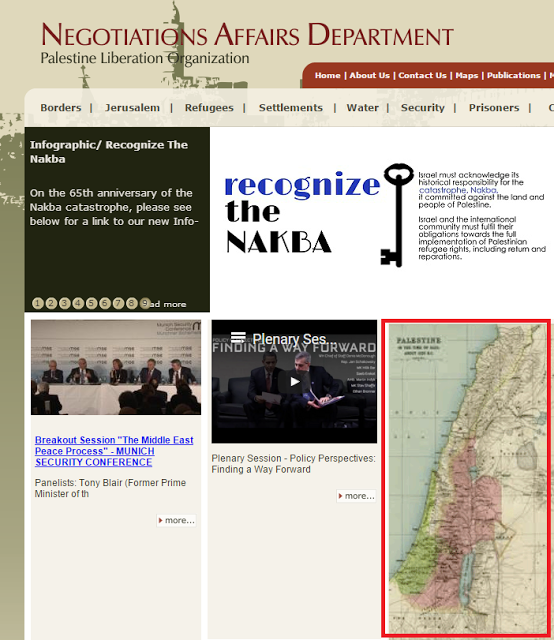 UPDATE: Fixed Hamas issue and added North Korea.